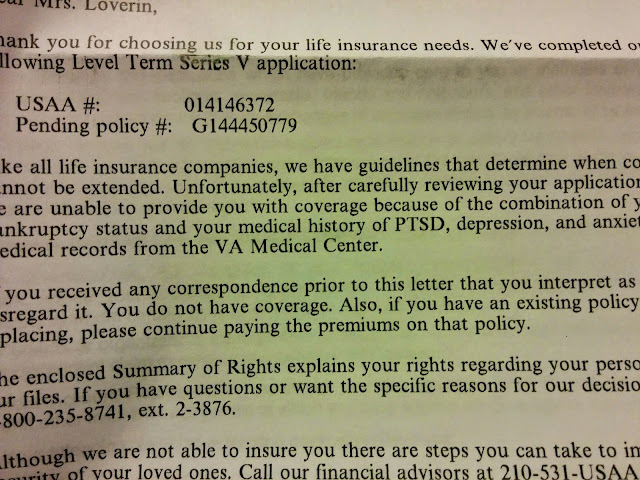 PTSD,a Veteran, and Life Insurance....when you place these three things together, they don't fit. I am an Iraq war veteran and I have PTSD. It's no secret. That one year has shaped my whole life since. I have three daughters; Mia is 7 now, Erika is a tween at 12, and AshLee is out of the house and living on her own at 22. If I die, what is going to happen to my babies?? Why does everyone else get the right to purchase life insurance to protect their kids in case something happens to them and I don't? Every day the news is full of someone's mom or dad who was killed in some freak accident and left behind a spouse and young children. Along with my disability, when I work, I am bring in $4,000 a month into our household to care for my family and pay the bills. If I die, my family will only receive my social security benefits and that's about $1500 a month until Mia turns 18 years old. That isn't even half of what I am able to provide for them now. 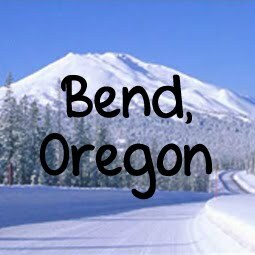 I'm just trying to provide something to help my husband and family get through my loss. I want my husband to be able to stay home and not work for a few months and be there for our daughters. My military benefits stop the day I die and they will not get one penny besides a paltry $200 death benefits. That won't even cover my cremation and a pretty urn. So thank you USAA, I appreciate the fact that you are comprised of 100% military members and their relatives. Yes, we are veterans and we've been deployed overseas. Now you are going to punish me for my service because I seek mental health services to deal with my issues. I don't hide in my house and drink them away. I acknowledge them and seek ways to learn how to deal with them and be a better mother and wife and sister and daughter and friend. I understand that we veterans have a very high suicide rate but I am not going to be one of your statistics! I have a beautiful family, a husband that stands by me through everything, a life of adventures waiting to be had. Why couldn't you have just added a suicide clause, USAA? I filed bankruptcy because US Immigration has been a nightmare for the last 8 years and I couldn't afford to do both things at once. Stay here and work to pay our bills or leave everything we had to follow my husband to Mexico in order to keep our family together. You judge me without even knowing who I am. Shame on you for treating a veteran this way. Instead, I'll just start saving a little money each month so that they will have something. I'm glad you approved the policy for my husband. At least he'll have a little piece of mind when he goes to sleep each night that his family will be provided for. I wish I could do the same.